The Large Magellanic Cloud (LMC), located only 160,000 light-years from Earth, is the nearest galaxy outside the Milky Way in which stars are actively being formed. With its high resolution, the Hubble Space Telescope can study details of star formation in the LMC as easily as ground-based telescopes can study stellar formation within our own Milky Way galaxy. N11 is the second largest star-forming region in LMC. It is only surpassed in the size and activity by "the king of stellar nurseries," 30 Doradus, located opposite N11. The Hubble image shows a detailed slice through a dynamic portion of N11B, in which spectacular glowing gas, dark dust clouds, and young, hot stars can all be seen. To the upper left of the image is a collection of blue- and white-colored stars that astronomers classify as belonging to types O and B. These stars are extremely hot, and some of them are among the most massive stars known anywhere in the universe. Just below the grouping of hot stars is an area of brightly emitting hydrogen gas, illuminated by the nearby hot stars to the upper left in the picture. Further to the right of the image are several smaller dark clouds of interstellar dust with odd and intriguing shapes, seen silhouetted against the glowing interstellar gas. Several of these dark clouds are bright-rimmed because they are illuminated and being evaporated due to the action of radiation from neighboring hot stars. The region around the cluster of hot stars in the image is relatively clear of gas, because the stellar winds and radiation from the stars have pushed the gas away. When this gas collides with and compresses surrounding dense clouds, the clouds can collapse under their own gravity and start to form new stars. The cluster of new stars in N11B may have been formed this way, as it is located on the rim of the large central interstellar bubble of the N11 complex. The stars in N11B are now beginning to clear away their natal cloud, and are carving new bubbles in turn. 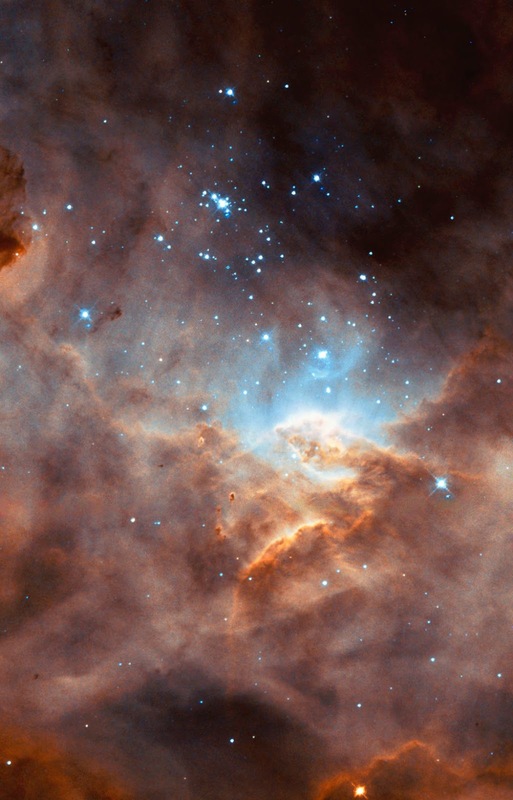 Yet another new generation of stars is now being born in N11B, inside the dark dust clouds in the Hubble image. The image thus illustrates a perfect case of so-called sequential star formation in a nearby galaxy - new star birth triggered by previous-generation massive stars. This image was taken with Hubble's Wide Field Planetary Camera 2 using filters that isolate light emitted by oxygen and hydrogen gas. The science team, led by astronomers You-Hua Chu (University of Illinois) and Yäel Nazé (Universite de Liège, Belgium) are comparing these images of N11B, with similar regions elsewhere in the LMC. This color composite of N11B was co-produced and is being co-released by the Hubble European Space Agency Information Center (HEIC) and the Hubble Heritage Project (AURA/STScI).